The ZPP40A tablet bottling machine for bobbin tubes is applicable to the packing of bigger and thinner tablets which are orderly fed into bobbin tubes in a single row in an overlapping way. The device utterly adopts a PLC for centralized control. It is verified in fiber and photoelectric detections and other kinds of detections to have steady performance and reliably automatic operation. It can automatically give alarms and shut down in case of no tablets, tubes or covers. Its part in contact with the tablets is made of superior 304 or 316L stainless steel, which totally meets the GMP requirement. Thus, it is the best device for pharmaceutical factories, health product factories and food factories to pack effervescent tablets and other products alike. 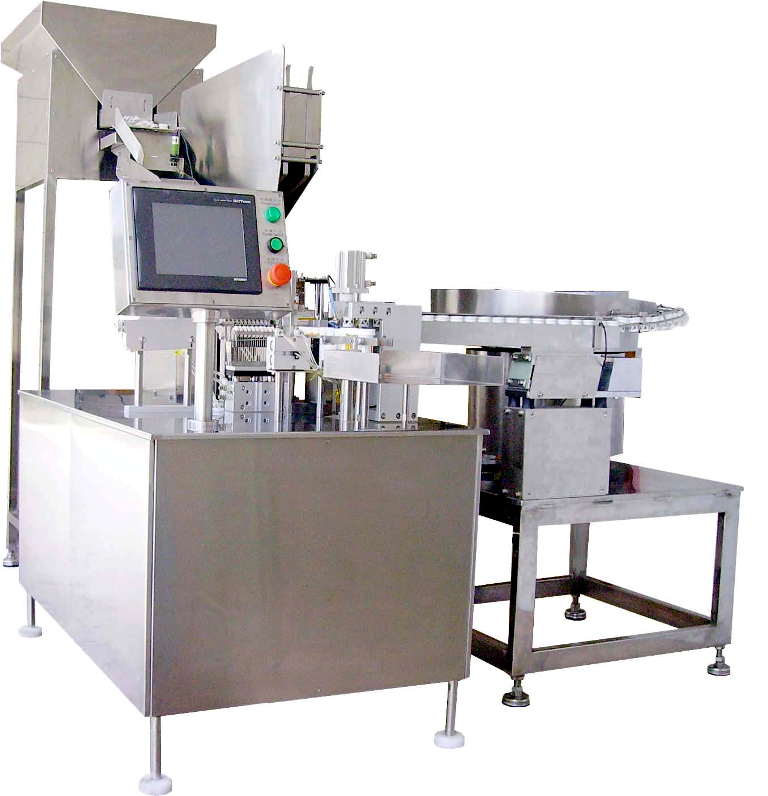 ZPP-40A tube filling machine for Effervescent Tablets, is applicable for large size thin tablet packaging packed in straight tube, this equipment is controlled by PLC, fiber and photoelectric checking, with stable performance, reliable action, and it can run automatically, with no tube no filling, no capping, when there is no sufficient tablet, tube, cap, it can send out alarm and stop automatically. 1) Oscillator for cap delivery: manually put the caps into the oscillator, the oscillator will deliver the cap to preset capping position. 2) Tube delivery: manually put the tube into the tube storage hopper, with swinging the tube will be arranged to tablet filling position automatically. 3) Tablet delivery: when the machine detects tube, it will lift the tablets and tablet delivery cylinder will push the tablets into the tubes. 4) Capping part: when the tube and filled tablets are detected, the capping part will press the cap into the tube automatically, no tablet no capping. 5) Auto control part: the running of the equipment is controlled by PLC, and it will operate automatically, when there is no tube or no cap, or no tablet, it will send out alarm. 6) Main material: the platform is painted, the cover is SS304, other material sainted Aluminum alloy, MOC SS304.